Why Pass Out Cigars When You Can Pass Out Medals? The origin of the tradition of passing out cigars when a baby is born is not exactly known, but theories say that it may date back to the American Indians who exchanged gifts to celebrate the birth of a child during the “potlatch” ceremony. The primitive cigar was considered to be one of the most valuable offerings. Other theories say that before babies were born in hospitals, they were often born at home where the father would anxiously await the birth in another room. Since the birthing process usually took a long time, it became a tradition for the father and his male friends to celebrate by lighting up a cigar once the baby or babies were born. Karl Goetz created a unique way for families to celebrate the birth of a child or children. 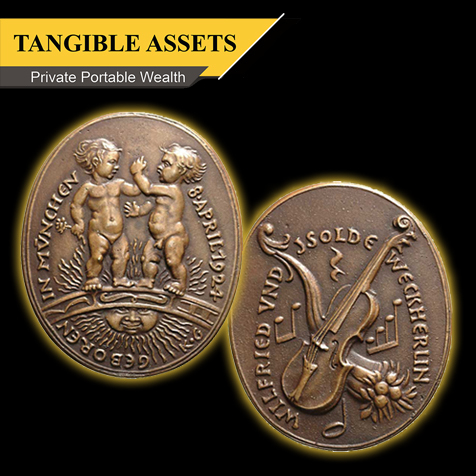 In this 1924 cast bronze birth medal, the birth of twins Isolde and Wilfried Weckherlin is commemorated. The twins are the children of Goetz’s own children’s violin teacher. One side portrays Isolde holding a flower and Wilfried clasping her left hand with his. The twins are shown standing on top of a zodiac with the sun rising in Taurus. The other side of the medal features a violin, musical notes, a cornucopia (symbolizing peace and prosperity), and a quarter-note (referencing their father’s profession). Would you rather hand out cigars or have a medal commissioned?